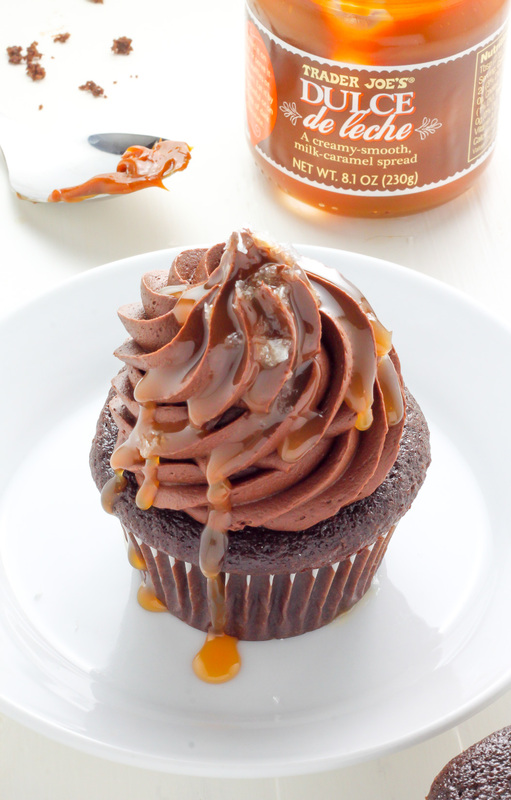 Dulce De Leche Chocolate Cupcakes! This SUPER decadent recipe is sure to become a new favorite. I’m beyond excited for today’s post, so I won’t waste any time getting right to it! Today we’re making Chocolate Cupcakes STUFFED with dulce de leche!!! This cupcake recipe should be pretty to familiar to you by now. It’s a little riff off of my Greek Yogurt Chocolate Fudge Cupcakes, which are a riff off of my Super Decadent Chocolate Cupcakes. Little changes, but basically, the same base recipe. What can I say…? When you find a good – no no, GREAT – chocolate cupcake recipe, you’re set for life! 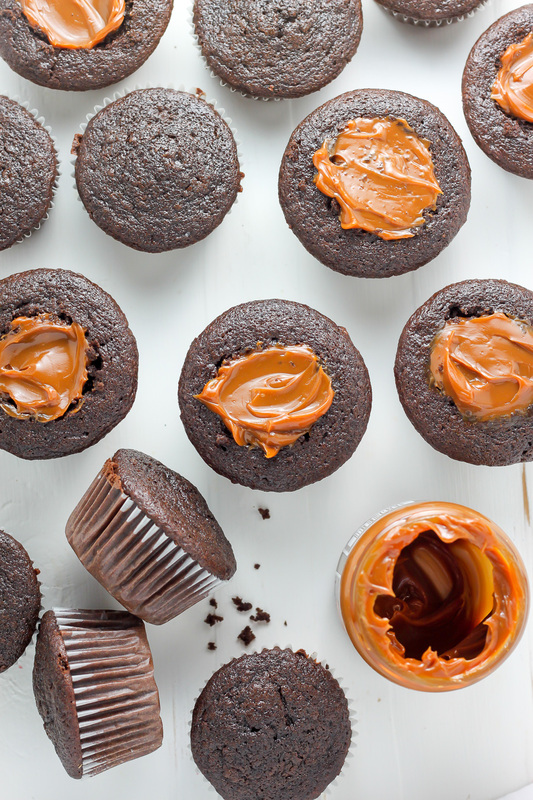 These rich, fudgy, ultra decadent cupcakes are stuffed with dulce de leche! Mmm. Let the record show Dulce de leche stuffed Chocolate Cupcakes are LIFE CHANGING! AMAZING! EPIC! 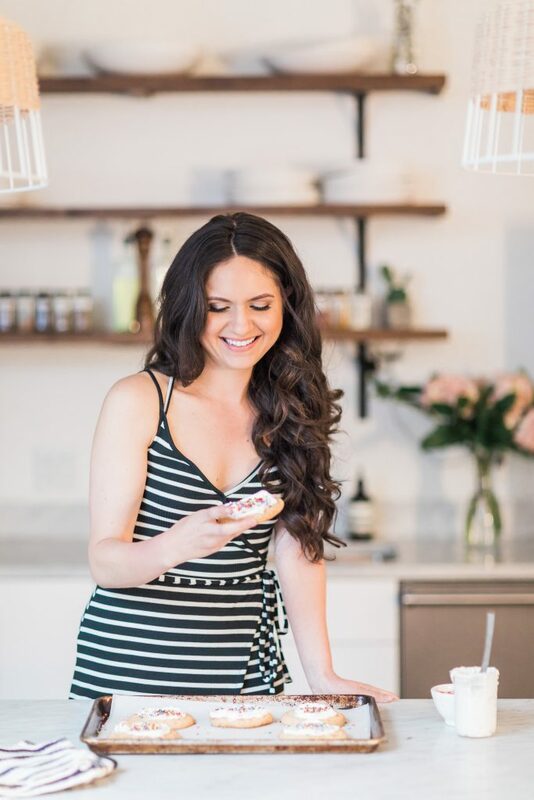 If you’re wondering what in the heck dulce de leche is… I’m here to help! Simply put, dulce de leche is a confection that’s created by slowly heating sweetened milk until it changes texture and color and turns into a most delicious sauce. When it’s literally translated it means something along the lines of “candy made of milk”. It’s thick, creamy, and irresistible! I buy a few jars from Trader Joe’s (not an ad; just the truth!) whenever we get there to shop, but you can also make your own if you’re feeling really ambitious. I suspect right about now you’re wondering about the frosting… am I right? Let’s get into it! 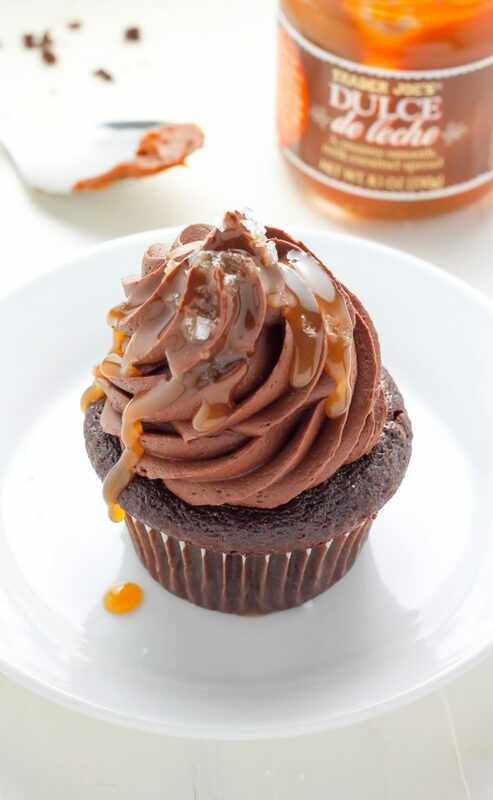 The chocolate dulce de leche buttercream is thick, incredible creamy, and full of flavor. Sift the confectioners’ sugar and cocoa powder before adding it to the butter. This is an important step because confectioners’ sugar and cocoa powder are lumpy by nature, and nobody wants to find lumps and bumps in their frosting. Be sure your butter is VERY soft before getting started on the frosting. It should be softer than room temperature, but not melted. I like to place my stick of butter out on the counter for an hour in the cooler months, and for about 35 minutes in the warmer months. Once all of your ingredients have been added to the frosting, whip it on medium-high speed for AT LEAST two minutes. This step is what really gives the frosting its light and airy texture. I like to set a little timer just to be sure I give it a full two minutes. Happy cupcake making to you, my friend! See you soon with a stuffed SAVORY treat. If you have any questions or comments, just leave them in the form below – I read each and every one and do my best to respond in 24 hours 🙂 LOVE YOU GUYS! 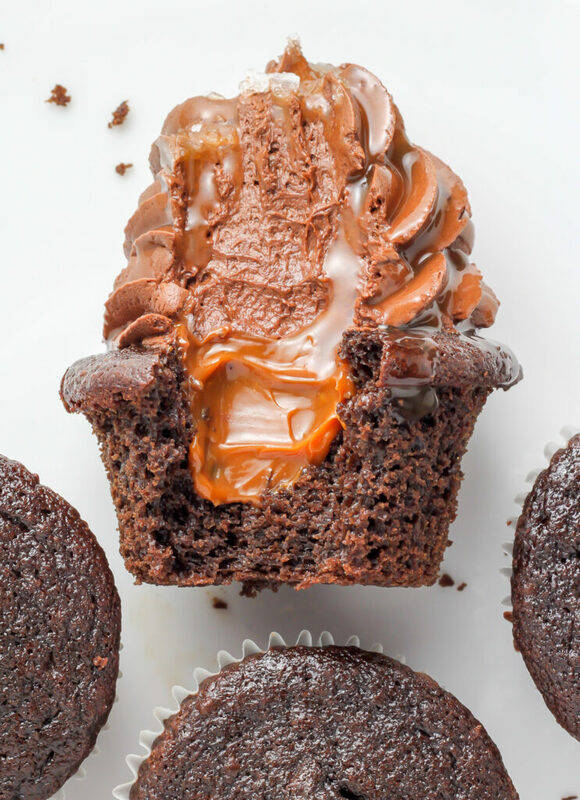 Chocolate Cupcakes stuffed with creamy Dulce De Leche! These are incredible. Preheat the oven to 350 degrees (F). Line a 12-cup cupcake/muffin tin with cupcake liners and lightly spray the liners with non-stick spray (optional, but it does help them peel right off). Melt the oil, butter,and chocolate together in the microwave, heating in 30 second increments, and stirring between increments each time. You may also melt the oil, butter, and chocolate over very low heat on the stovetop, but I find the microwave option to be much easier. Whisk mixture until completely smooth; set aside to cool. In a medium sized bowl combine the flour, baking soda, baking powder, cocoa powder, and salt; stir together until thoroughly combined; set aside. In a large bowl, whisk together the eggs, yolk, sugars, and vanilla; beat until smooth. Add the cooled oil/butter/chocolate mixture and whisk until smooth. Add half of the flour mixture, then half of the sour cream. Repeat the process until everything is added, and be sure to mix until JUST combined - then quickly stir in the hot water. It's important not to over mix, here! Just stir until evenly combined. Divide the batter among the 12 liners in your prepared pan. Bake for 16-18 minutes, or until a toothpick inserted in the center comes out clean. Cool *completely before filling with dulce de leche and topping with frosting. Once cooled, use a small sharp knife to carve out a small hole on the top of each cupcake. The size and depth of this hole is up to you, but I recommend not carving too wide or deep, since this may cause your cupcake to fall apart when bitten into. Fill each hole with 1-2 teaspoons of dulce de leche. Sift together the confectioners sugar and cocoa powder, whisking well to ensure it's bump and lump free! Using a handheld mixer OR a stand mixer fitted with the paddle attachment, beat the butter on medium-high speed until creamy; about 2 minutes. Reduce speed to low and slowly add the sifted sugar/cocoa powder, alternating with the half and half; add in the dulce de leche and salt. 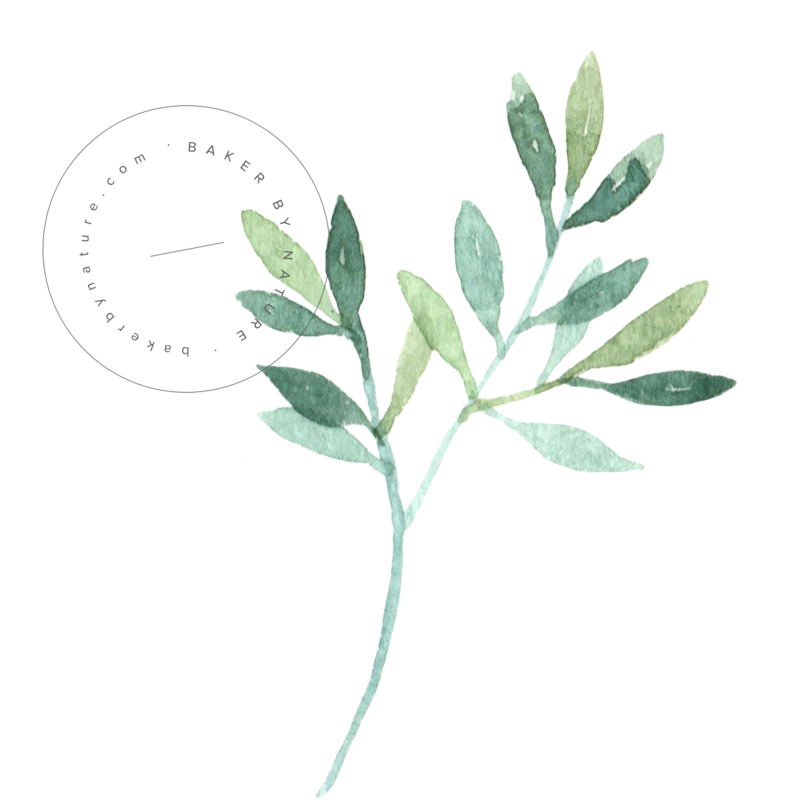 Once all of the ingredients have been added, beat on medium-high speed until light and creamy and combined; at least 2 minutes. Add more cream to the frosting if it seems too thick; add a touch more sugar to the frosting if it seems too thin. Frost cooled, filled cupcakes and top with more dulce de leche and flaky sea salt, if desired. Cupcakes can be kept in the fridge in an airtight container for up to 4 days; bring to room, temperature before serving. Dulce de leche can be found at many grocery stores as well as specialty food shops. I recommend using one you know and enjoy - just be sure it's stirred well before using; you want it smooth and creamy! You seriously make sinful cupcakes!! They are always so amazing looking and I just want to lick my screen. Thank you, Zainab 🙂 You’re so sweet! You would totally love these decadent cupcakes. It’s so easy to go hog wild at TJ’s 🙂 Glad I’m not alone!!! Haha! That’s exactly my reaction when I bake these, too. Thank you, Hollie. Did you heat the dulce de leche before you drizzled it over the top? I would like to know can I use dark dutch cocoa in the recipe? Wer all love dark chocolate! If so do I need to make any changes to the recipe? Also what thin sauce did you use for the top of the cupcakes for the drizzle? Brand etc. Id like to make these today they look yummy! Thank you in advance for a reply! We don’t have a trader joe’s anywhere near us (closest one is about 250 miles away). What other brand is similar to this decadent caramel? You can also put the condensed milk (label removed, on its side) in a crockpot covered with (1 inch above can) water for 8 hrs on low. Let can cool completely before opening. Type of # or frosting tip did you use? Love dulce de leehe and these look so rich and decadent! Love that there’s a filling too! How long would you bake these for if you were to make mini cupcakes? Hie my name is rabia l just love your cupcakes especially that filling lookes devine an yummy but my problem is lm living in Turkey an l couldn’t find Dulce De Leche here so l dnt knw where to get it l so much want to try these cupcakes my kids would love them,what can l substitude that with? You could actually make your own from sweetened condensed milk if you can find that. Just put an unopened can of condensed milk in a large pan. Cover with water till the can is submerged in the water, put the whole setup on the stove at medium heat for 3 to 4 hours or more if you want a darker colour. Be very careful while removing the can out of the water. Let the can cool down completely before opening. Hiya, just wondering can you write the ingredients//measurements in grams please? Thank you!! This chocolate cupcakes are looking so delicious, I will definitely try to cook this amazing dessert. Thank you for sharing this recipe with us. How high do you fill your liners with the batter? 1/2 way? Full?